When Fear My Thoughts broke up in 2010, their guitarist Patrick Hagmann finally had enough time to concentrate on his new project. Earthlimb has next to nothing in common with the death metal and metalcore of his previous band, instead he recruited drummer Norman Lonhard from Tom Warrior’s Triptykon and vocalist Alex Bleiziffer of relatively unknown thrashers The Hellcall to help him record his debut album Origin. 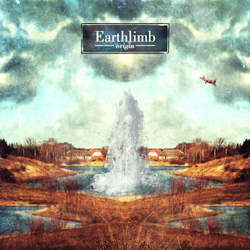 The flying pig on the cover artwork is already a very strong nod to Pink Floyd’s Animals album, and even while one may not have expected this at first, Earthlimb is Hagmann’s venture into progressive sounds. Combining modern art rock (Amplifier, Oceansize) with the more classical prog and kraut sounds, and adding a dose of post rock for good measure, the trio offers a very contemporary mix that should have no problems finding a fan base. Starting with the short, moody intro Origin, things get meatier with Hiding, a seven and a half minute long epic art prog song that is scoring with varied instrumentation, a memorable melody and Bleiziffer’s charismatic vocals. This is followed by the instrumental Pulsar, with four minutes one of the few shorter tracks, a surprisingly psychedelic track that stands a little apart, but in a good way. The following songs, apart from the even shorter Bloom Of Light, are all between six and eight minutes long. This gives Earthlimb enough room to cram in all their ideas, but in the end one would have liked more moments of unexpectedness like the aforementioned instrumental. Most of the songs start like ballads, with mellow instrumentation and smooth vocals, but Hagmann can’t quite give up his metal parts and still never fails to occasionally crank up the guitar. While he never quite tries to reach the level of aggression of Fear My Thoughts, these more dynamic parts help to set the music apart from other current art rock bands. Only the concluding Waves is rocking from the start, and with its organ part even comes closer to the sound of the Seventies than the more melodic preceding material. In the end, Origin is a very pleasant album, and despite – or because of – its many varied influences, the band is not yet quite reaching an overly original sound. Nonetheless Origin is a very promising album that makes probably not only me eager to await further deeds in the future.